I have always loved fighters and breakaway specialists. They give so much for so little glory. I thought to myself; would it not be awesome to follow a fighter-PCM rider? I made a virtual rider named Jean-Charles Brochard. His career goal is to win the KoM jersey in Le Tour de France. Born in Lyon, just outside of the very famous Alpes we see every year on television, this kid loves Le Tour. I made him as young as possible, lowest potential, fighter as primary specialization and no second specialization. You are looking at the worst possible stat-line you could have in the "Pro-cyclist"-mode in PCM18. Would you love to watch a young French kid fight for KoM jerseys in insignificant races grow and finally fight in Le Tour? Stay tuned! Good luck mate! you should really focus on your mountain training, will take some good years but you can have a very complete rider with good focus. Finally, my first pro season kicks off! As you can see, we will mostly compete in French races. As a big but not very good French continental team, that is our duty. During these three months there is many .1 races meaning the competition is harder than the usual .2 races. More glory if I succeed. I will not report from many classics this first season. In those races, I will mostly be a helper and I am not strong enough to go in breakaways in classics yet. Later in the season I got a free role in some classics, there it will be a more detailed report. A prologue! Not my cup of tea. Should be fun to try a fancy helmet and get in the action in a stage race. I cannot wait until tomorrow. Fun time! Finally, some KoM points to hunt. I will try to find the right breakaway group and follow them. I will not spend much energy in the breakaway. The other riders there will have to do the heavy lifting, I am not in a very good shape. So much for that idea. I had the whole breakaway planned out, and then my captain demands me to join the rest of my team in the front of the pack and pick up the pace. Welcome to the life as a helper. We kept the breakaway riders at close distance to control everything and make the sprinters fight for the victory. Fellow Frenchman Adrian Petit won the mass sprint. At the end of the race, there was a massive crash in the rear end of the pack. I fell of my bike but did not get hurt. 1. Adrien Petit 3h25'51" 1. Peter Kennaugh 3h38'43"
2. Diego Ulissi st. 2. Jean-Pierre Drucker +9"
3. Simone Consonni st. 3. Filippo Ganna +10"
4. Jean-Pierre Drucker st. 4. Mateusz Taciak +12"
5. Thomas Boudet st. 5. Marcel Sieberg st.
110. J.C. Brochard st. 116. J.C. Brochard +3'33"
I did not manage to join the breakaway from the start. Today's breakaway was five riders, and with five kilometer left to the first KoM points, I managed to break loose from the pack and I tried catching the five riders in front of me. With 50 kilometer left the pack made me a fool and caught me right before the KoM sprint. I never had contact with the breakaway and finished the stage with only two riders behind me. A bad day at work, but I have nothing to lose; one bad stage will not break me. There will be many of them in the future. 1. Giovanni Visconti 2h55'18" 1. Peter Kennaugh 6h34'00"
2. David Gaudu st. 2. Vegard Stake Laengen +17"
3. Odd Christian Eiking st. 3. Manuele Boaro +19"
4. Alexis Gougeard st. 4. Diego Ulissi +24"
5. Matej Mohoric st. 5. Jan Bakelandts +32"
134. J.C. Brochard +12'59" 134. J.C. Brochard+16'32"
The final, easy stage. Not much for me to do here. 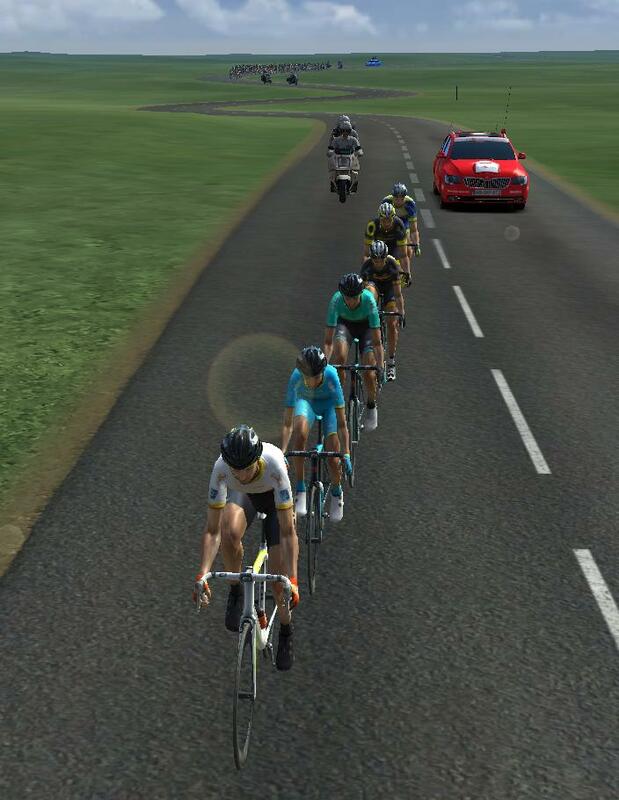 I helped my team out in the front of the pack in about 30 kilometers before the sprinters' teams took over the lead. Cannot say I am very happy about this stage race, but it is at least a start. You have to start somewhere. 1. Ramon Sinkeldam 2h59'44" 1. Peter Kennaugh 9h33'44"
2. Daniel Oss st. 2. Vegard Stake Laengen +17"
3. Giovanni Visconti st. 3. Manuele Boaro +19"
4. Thomas Boudat st. 4. Diego Ulissi +24"
5. Andrea Guardini st. 5. Jan Bakelandts +32"
116. J.C. Brochard st. 132. J.C. Brochard+16'32"
The toughest stage of the tour is right away at stage one. Our captain Le Cunff and I managed to get in today’s breakaway with six other riders. With 6,5 kilometer left to the first KoM points we had a 2'03" gap to the pack but I had lost a lot of energy. 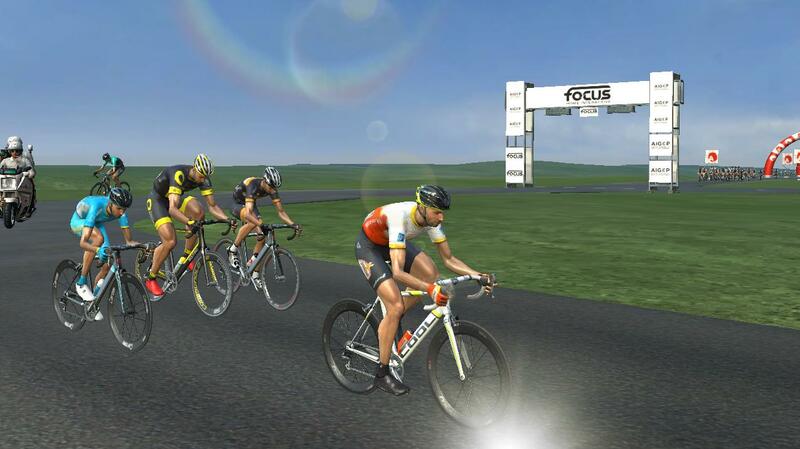 The plan was to fight for the KoM points and help Le Cunff to a stage victory. Unfortunately, I finished fifth on the first KoM climb and received zero points. 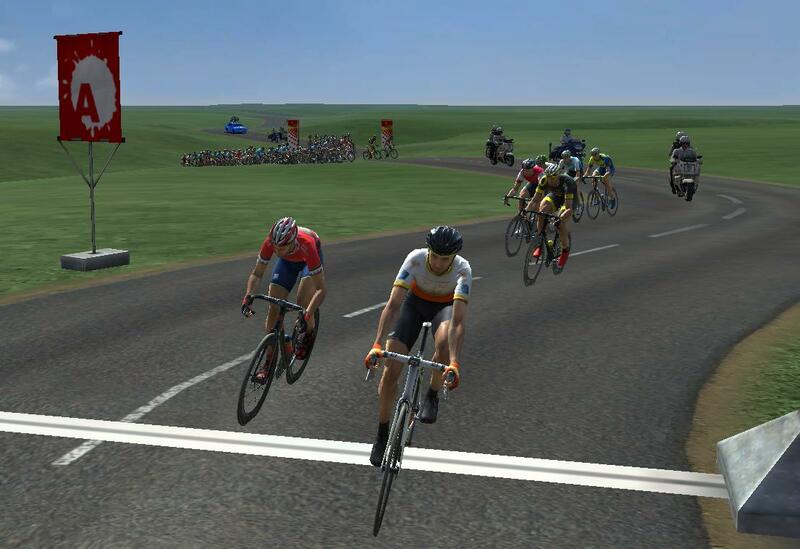 With 70 kilometer left I fell behind the breakaway and the pack caught me. I did not even manage to stay in the breakaway until the second KoM climb. Only kilometers later, the rest of the breakaway with Le Cunff was gone too and the pack moved towards the second KoM climb. This time there was not a single rider but I who fought for the points. I have no idea why. The rest of the pack did not even care. I continued my attack after the top of the climb and just like that I had a +20" gap on the pack. With 6,1 kilometer to the next KoM points I had +36", but my power was gone and I had almost nothing left in the tank. Unfortunately the pack caught me with 1,2 kilometer left to the top of the climb. At least we gave them a fight. Once again, I attacked with Le Cunff. Our breakaway failed right after the first climb where I had no chance of securing any points. However, before the second climb when we were back in the pack I tried a little "razzle-dazzle" and attacked at the flats before the KoM points. I had a +21" gap when the climb started and barely managed to win first place at the last KoM climb. Moving up in the KoM standings! Marc Sarreau won the mass sprint in front of Daniel McLay, Mathieu Van der Poel, Nacer Bouhanni and Jurgen Roelandts. As expected we did not perform well at this team time-trial, we finished 16th of all 20 teams. I spent the rest of the day recuperating for tomorrow. There is eleven available KoM points during tomorrow’s stage. There is nine points between Roelandts and Me, there is only one thing to do. 1. BMC Racing Team 12'35" 1. Jurgen Roelandts 9h21'00"
2. Michelton - Scott +16" 2. Stefan Küng st.
3. Team Education First +17" 3. Nicholas Roche st.
4. Ag2r La Mondiale st. 4. Miles Scotson st.
5. Team Sky +32" 5. Francesco Ventoso st.
16. St. Michel - Auber 93 +1'36" 77. J.C. Brochard +1'37"
After some back and forth in the start, I finally managed to join today’s breakaway. It was a big breakaway, 12 riders strong. I had two teammates with me in the breakaway, Thominet and Le Cunff. I was ready for the KoM points! 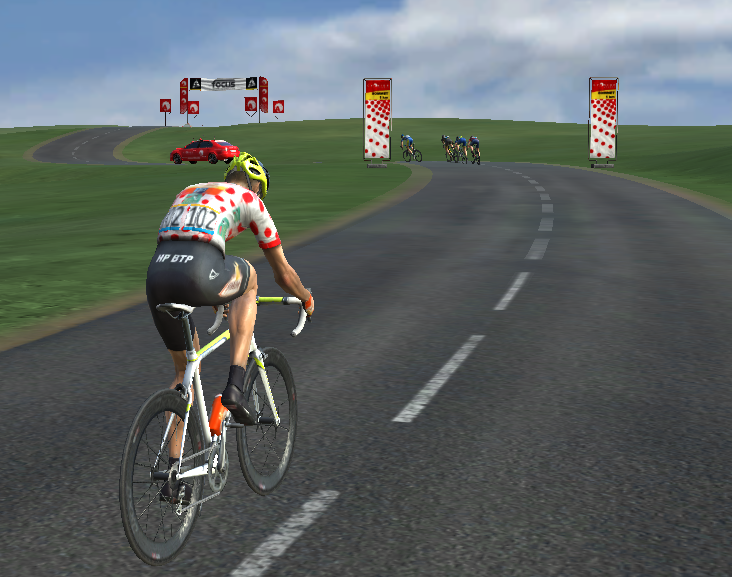 I sat a high tempo in front of the breakaway and made an attack with 700 meters left to the KoM points. Even though my weak stats I made first place at the climb! Now I was second overall, four points behind Roelandts, meaning I have to finish first at the next KoM sprint. We were closing in on the last KoM points but the pack was also closing in on us. Le Cunff ordered me in front to do an effort to keep the pack at distance. Not perfect to use this much energy, but if I do not do this we will be caught by the pack anyway. The climb is 5.1 kilometer and at the start of the climb, we had a 2'23" gap to the pack. If I can manage to finish first at the climb I will win my first ever KoM jersey. Easy to say, harder to do. I fell behind and had just no fuel left in the tank. This was so disappointing. I had an opportunity to steal a KoM jersey in front of Roelandts eyes but when it came to the last quarter, I had no chance. The pack caught the breakaway during the mass sprint, Le Cunff was only centimeters away from our first victory this year. 1. Jérôme Baugnies 4h19'37" 1. Stefan Küng 13h40'37"
2. Kevin Le Cunff st. 2. Nicholas Roche st.
3. Deilo Fernandez st. 3. Michael Albasini +17"
4. Laurent Pichon st. 4. Jan Bakelandts +18"
5. Quentin Pacher st. 5. Alexis Gougeard st.
85. J.C. Brohard +8'25" 76. J.C. Brochard +10'02"
Even though I did not manage to win the KoM jersey in Tour Cycliste International la Provence, finishing second just four points behind Roelandts is not too bad. I feel good about this start. You have to start somewhere and I have had many questions answered. Keep in mind, so far I have only competed in .1 stage races. Next period will bring not as hard competition as the races during this period. Fighting in breakaways in Tour Cycliste International la Provence and almost conquering the KoM jersey. Only French races! We like it that way. This time there is plenty of .2 stage races where I will have opportunities to win KoM jerseys and fight in a breakaway for a stage victory. Both would be a dream come true. Today's plan was simple. Do nothing. I will obviously help if my captain tells me, but tomorrow is the big day for me. There is plenty of KoM points to fight for tomorrow, so to use a ton of energy today would be stupid considering there is only five KoM points available. 1. Mathieu Van der Poel 4h19'25" / 4h19'15"
2. Dimitri Claeys st. / +4"
3. Michael Van Staeyen st. / +6"
4. Emiel Vermulen st. / +10"
5. Cyril Lemonie st. / st.
54. J.C. Brochard st. / +10"
I managed to join today’s breakaway with seven other riders making it a good-sized breakaway. The other riders were at my level and I had good chances of wearing the polkadot tomorrow. During the first KoM climb, I tried to set a higher pace. The other riders replied quickly. 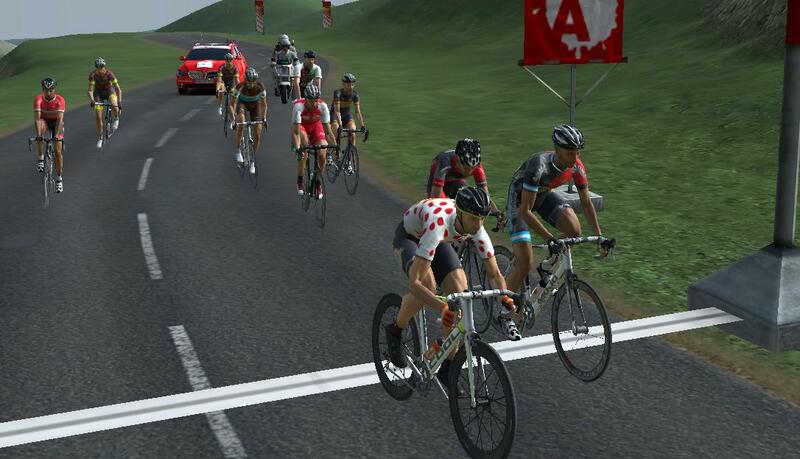 With two kilometers left to the KoM points, several riders tried to attack from the group. I tried to stay focused and not go too early. 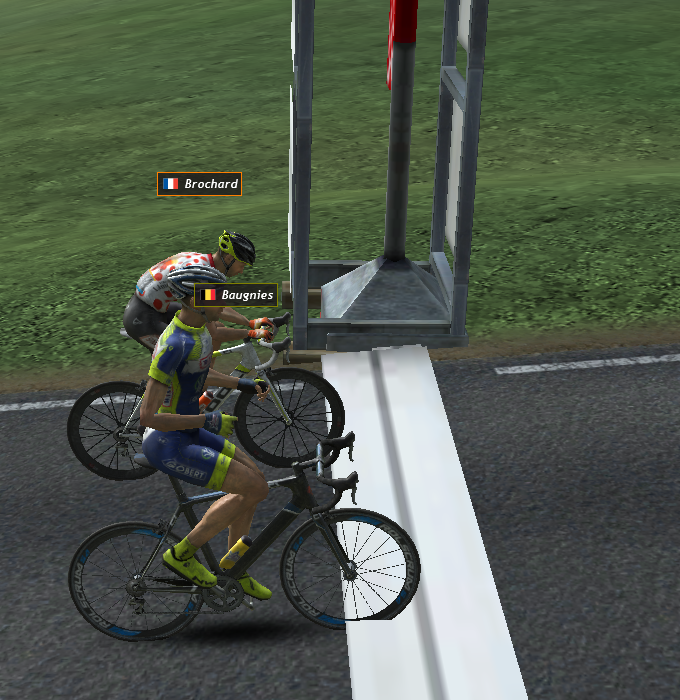 It worked out well until Fouche from Team Wiggins came from behind and beat me by only centimeters. At the second climb, I had even more difficulties. I finished fourth and was never even close. I now had 18 points and the leader Fouche had 28. On the third climb, I realized I maybe was not strong enough for this. 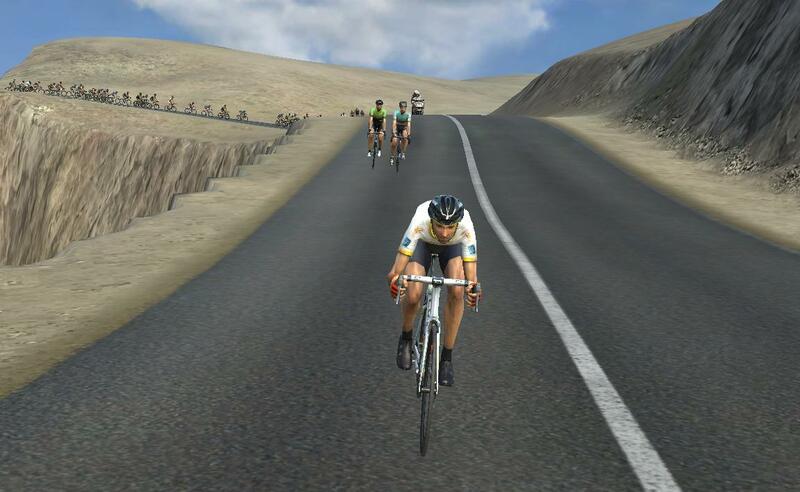 I finished fourth again and Fouche won this climb making the gap even bigger to the other riders. At the fourth climb, I finished fifth and before the fifth climb, I was back with the pack. Grupetto here I come. Team time-trial, there is not much we can do here. We will not use too much energy and look forward to tomorrow’s stage. 1. Cofidis, Solutions Crédit 25'18" 1. Florian Vachon 9h11'04"
2. Team Fortuneo - Samsic st. 2. Dimitri Claeys st.
3. BHS - Alemborg-Bornholm st. 3. Romain Hardy +5"
4. Wibatech Merx 7R +24" 4. Anthony Perez +6"
5. Bennelong SwissWellnes Cycling Team st. 5. Maxime Bouet st.
12. St. Michel - Auber 93 +1'09" 105. J.C. Brochard +15'30"
I decided to do nothing tricky during this stage. 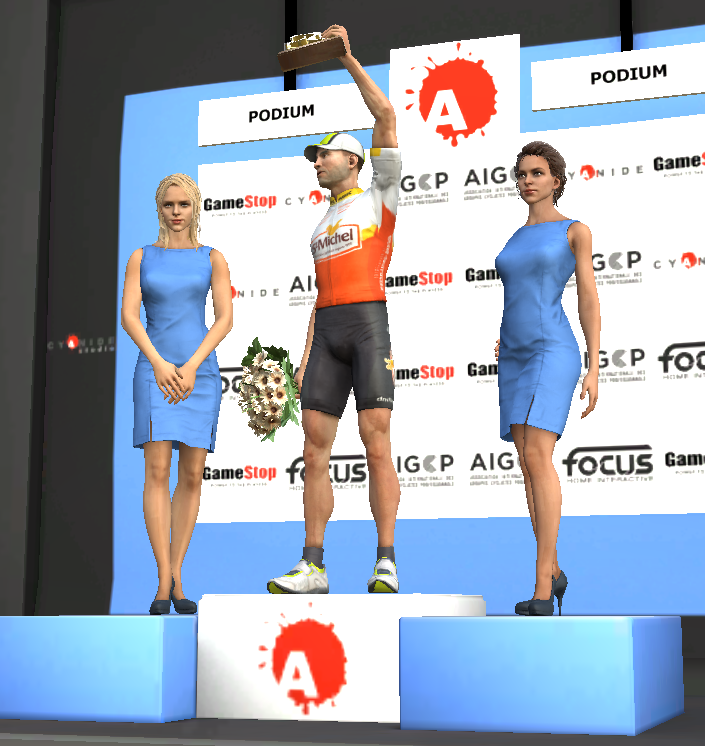 I cannot win the KoM jersey, and I do not want to spend a lot of energy for a podium placement. I will sit back and relax. 2. Florian Vachon st. 2. Anthony Perez +8"
3. Anthony Perez st. 3. Romain Hardy +11"
4. Romain Hardy st. 4. Maxime Bouet +12"
5. Cyrli Lemonie st. 5. Cyril Lemonie st.
98. J.C. Brochard +4'22" 104. J.C. Brochard +19'58"
With only two stages, this will be an intense and tough stage race. There is ten KoM points available for me out there today, but I am not trying to go for any breakaway. If the breakaway is gone before one or both of the climbs, I will obviously fight for the points that is left. The pack caught the breakaway between the climbs. I attacked at the flat 500 meters before the start of the second climb, no riders wanted to follow. It was five easy points. When I was at the top of the climb I turned around and saw the pack far behind. I had gotten a 41" gap without even trying. There is 40 kilometer left, should I go for the stage or not waste any energy before tomorrow? As stupid as I am, I tried to get the stage victory. With 20 kilometer left I had a 1'01" gap to the pack. With 7 kilometer left my little adventure was over. I had used a lot of energy and I am not sure if I am ready for tomorrow. 57. J.C. Brochard st. / st. This will be a tough challenge. Looking back at it I obviously should not tried to go for the stage victory yesterday, but I cannot change what I did yesterday. Today I there is a new and extremely tough stage. 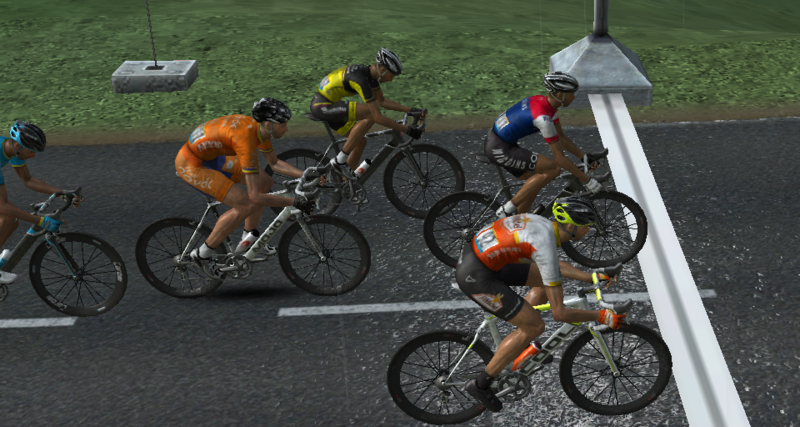 I attacked from the very first meter and formed a breakaway by my own. 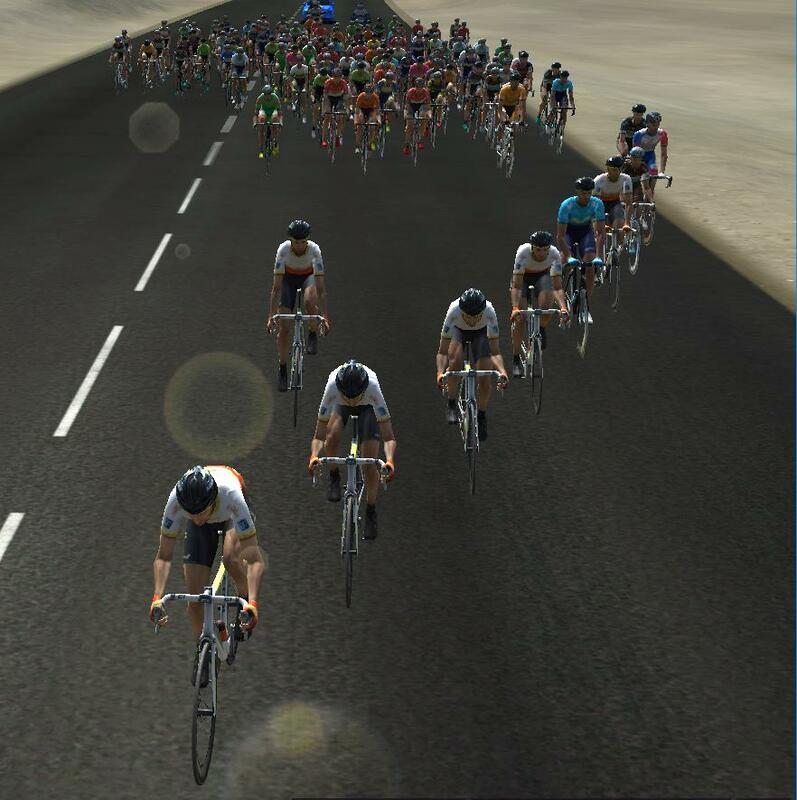 Later on during the stage, more and more riders joined my breakaway. With 145 kilometer left we formed a ten man breakaway 4'40" in front of the pack and 2'24" in front of a two man chasing group. My legs felt fresh even though yesterday’s attack and I was ready to win my first KoM jersey. 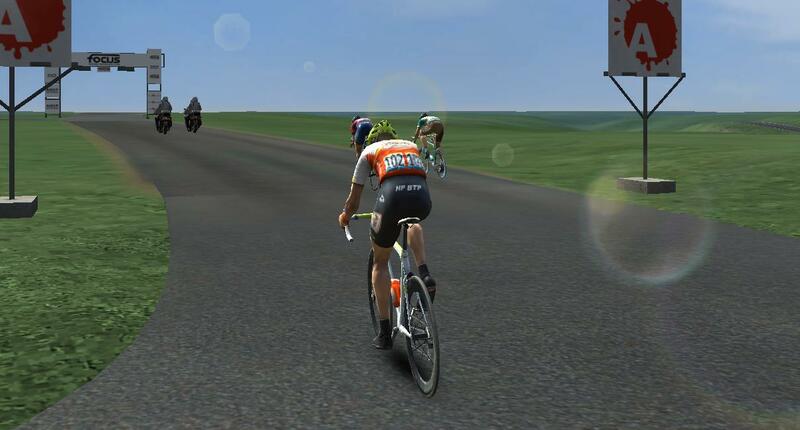 It became a dogfight for the KoM points. There was ten riders who all wanted the KoM jersey, but I had something they did not. Already five points. I waited as usual, made my attack a tad bit late, and ended up second. It is not too bad. I now have nine points; I am the virtual leader of the KoM classification and still have a good chance to win the classification of this race. During the second climb, I did the exact same tactic, only this time I made a fool of my opponents! My legs felt so good today and it was an amazing feeling to see the legs respond to my feelings. Now I had 19 points and the second place had 12 points. A 1st category climb was left where the first place gets 16 points. Can I do it? The pack caught us before the last and big climb. I just let myself slide through the whole pack and fell behind. I had nothing left in the tank at this moment. I was extremely nervous. I had the chance to win my first ever KoM jersey. I had lost track of where the rest of the breakaway riders was. If one of them managed to hang on to the pack, he could take my jersey. YES! It did. My teammate Levaret took all 16 points and secured my jersey. No riders from the breakaway managed to hang on to the pack anyway, my first ever KoM jersey was a fact! Levaret took this stages' third place and finished 3rd overall. What a race for St. Michel - Auber 93. It feels great to win! 1. Mauro Finetto 5h14'04" 1. Mauro Finetto 9h24'23"
2. Antonio Santoro st. 2. Antonio Santoro +10"
3. Guillaume Levaret st. 3. Guillaume Levaret +12"
4. Maxime Bouet 2'41" 4. Maxime Bouet +2'57"
5. Tanguy Trugis 3'25" 5. Tanguy Trugis +3'41"
46. J.C. Brochard +11'54" 43. J.C. Brochard+12'10"
There is plenty of KoM points out there today. Since the KoM climbs is so late in the stage I will use the protection of the pack until they catch the breakaway, then I make my move. With 4,5 kilometer left to the first climb I made my attack. The breakaway with just three riders had only a 43" gap to the pack so I was confident I could catch them before the KoM points. I did so but only finished second, a good start to the stage. 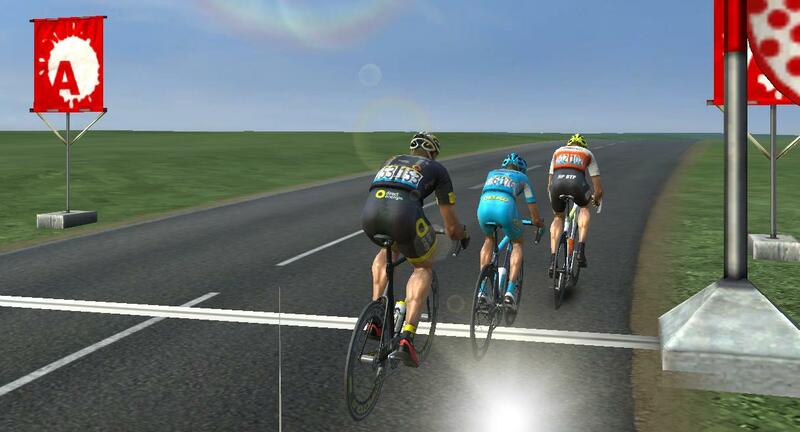 The rider who won the sprint, Geniets, formed a two man breakaway in the front with me. The two other riders fell behind during the first climb. We managed to keep a descent distance down to the rest and it was up to one of us to take the second KoM climb. Just as the last climb, Geniets finished first and I second. He is way too explosive for me to keep up with in a sprint. I did not manage to crack the code on how to beat him until the first 2nd category climb where I was the first one past the white marker on the road. It is great to be first when it matters the most. Geniets was done for the day and I went solo, barely managed to take the second 2nd category climb before the pack caught me, and spent the rest of the day in the pack. I now had a descent lead on Geniets. 98. J.C. Brochard +4'23" / 4'29"
At this stage, I will attack from the very first meter. There is many points to fight for in the first half of the stage. I joined today’s breakaway with five other riders. Geniets was there with me, he would not give up. I did not manage to get any points at the first climb, but that did not Geniets either. The next climb, a 1st category, is very important. 16 points to the winner! I stayed in front of the breakaway and waited for the other riders to do the first move. I finished third and had no chance against the two riders in front of me, but Geniets finished fourth so I gained two points on him. Geniets fell behind during the third climb and the two who beat during the 1st category climb formed a three man breakaway with me. I still had no chance in the climbs and finished third once again. To make it the day of third places I finished third at the last KoM climb too, but I would consider this a very successful day. 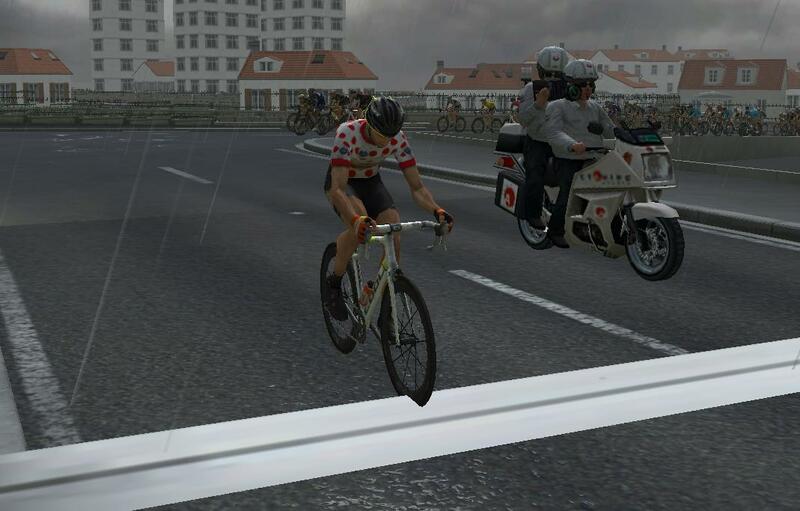 Van der Poel won the mass sprint and I finished with the pack at 23rd place. Another very tough stage. My plan is once again to start a breakaway from the first meter and fight for the first KoM points. I do not think I can do anything with the two 1st category climbs at the second half of the race anyway, so I will focus on the first three. 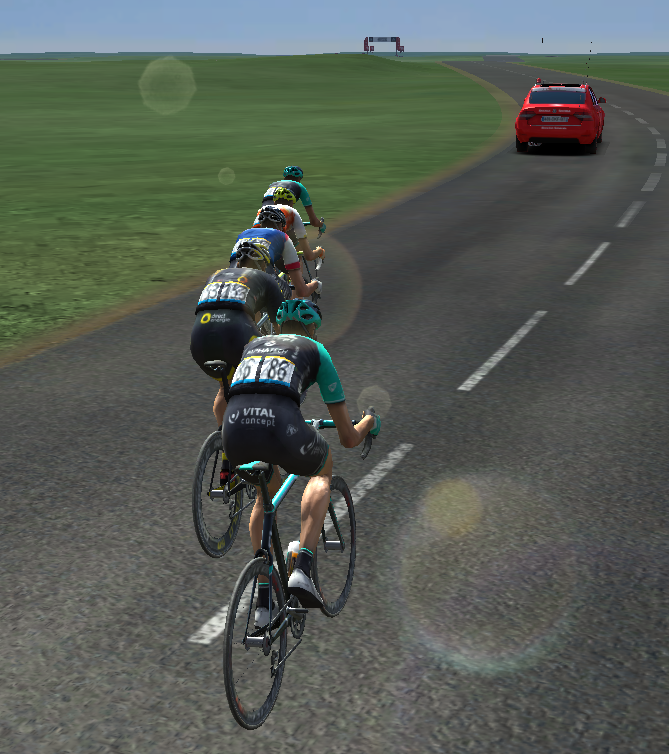 Ten other riders, including Geniets, joined the breakaway I started. Give credit to that man for never giving up. We were the only two in the top five of the KoM classification in the breakaway. Only Merignat beat me at the first climb and Geniets got zero points. Great start. It continued even better when I won the second climb in front of Geniets who finished second. We now had 30 tough, flat kilometers in front of us with the pack trying to chase us down. On my way to my second KoM jersey? There is 10 KoM points at the winner of this climb. I cannot afford to lose that many points to Geniets. 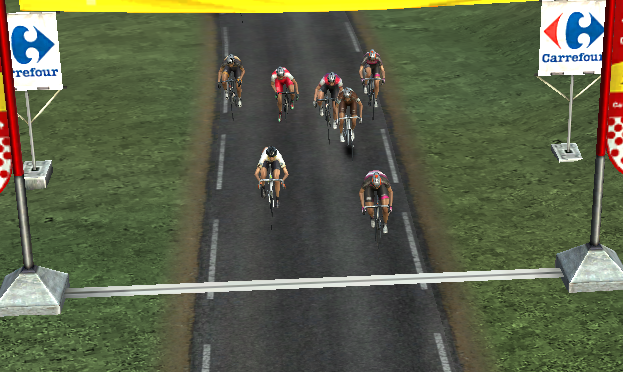 I misjudged the finish and got zero points while Geniets won the KoM sprint! This is horrible. After this climb the pack passed me in a hurry and I could “relax" the rest of the stage with two 1st category climbs left... Jesús Herrada won the stage. Seven KoM climbs to decide who wins the jersey. This will be both fun and very difficult. As usual, I started a solo breakaway in the start and eight riders joined me, but before they had managed to get to me, I won the first KoM climb (a 2nd category climb). It felt amazing to get ten points like this almost as it was free. I decided to not fight for the 3rd category that came right after it. I had not a lot of energy left and the next is a 1st category. During the 1st category climb I made an attempt to escape from the breakaway and it worked. With 1 kilometer left I had 20" gap and won with the length of a wheel. Another 16 points added to my total, amazing. The next to climbs has an extremely low percent finish, meaning my good flat skill will come in handy. When I won the first of those two climbs in a sprint with four other riders, both the rest and I understood I am winning this KoM jersey. I let myself fall behind the breakaway and joined the pack. It was a nice day to be me. 1. Bryan Couqard 4h42'44" 1. Pierre-Luc Perichon 17h13'33"
2. Pierre Barbier st. 2. Jesús Herrada st.
3. Mathieu Van der Poel st. 3. José Herrada +6"
4. Adam Toupilak st. 4. Deilo Fernández +10"
5. Bert De Backer st. 5. Julien El Fares st.
58. J.C. Brochard st. 63. J.C. Brochard +12'44"
Another team time-trial, this time we actually got a very nice result. Top five is not bad for us. 2. Delko Marseille Provence KTM +9"
4. St. Michel - Auber 93 st.
5. Tirol Cycling Team +35"
Compared to the two last KoM jerseys I have won, winning this will be a lot easier. With that said, this time I have to focus on my team. There is only five KoM climbs in total so if I fail at one climb I could easily end up with zero points during one stage. That is why I will focus on helping Touze this stage race. 4. Mathieu Van der Poel st.
We had no chance of putting Touze in position. There was just too high speed and too many good sprinters in this race. 1. Mathieu Van der Poel 3h37'37" 1. Graham Briggs 7h49'26"
2. Nacer Bouhanni st. 2. Robert-John McCarthy st.
3. Bram Welten st. 3. Ian Bibby st.
4. Lorrenzo Manzin st. 4. Thomas Moses st.
5. Jérémy Lecroq st. 5. Edmund Bradbury st.
49. J.C. Brochard st. 28. J.C. Brochard +28"
What a month! 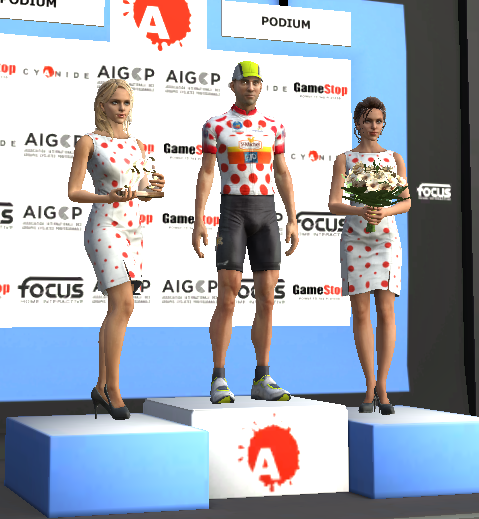 I cannot believe I was able to win two KoM jerseys in a row. The first one was somewhat lucky, but to win the second one I really had to dig inside myself and lay it all out on the road. This period finished off very weak in A Travers Les Hauts De France, but it did not really matter because of my success earlier in the period. 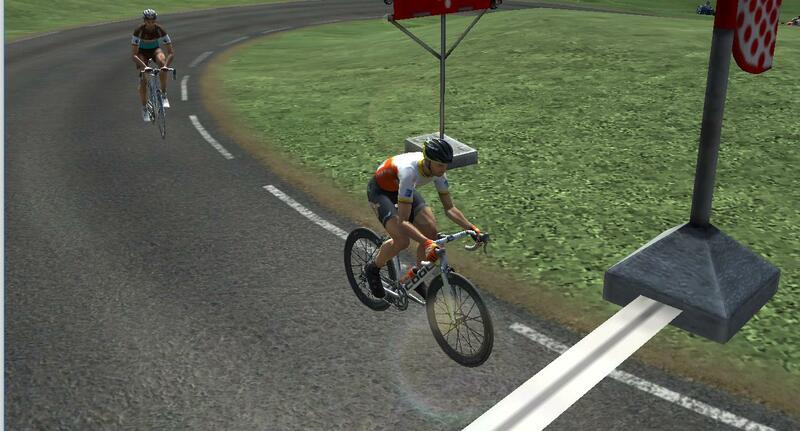 Winning my first ever KoM jersey in Tour de Jura Cycliste. Nice to see that you're still around EgArB! Love the story so far and cool that you went for low potential and fighter specialization. 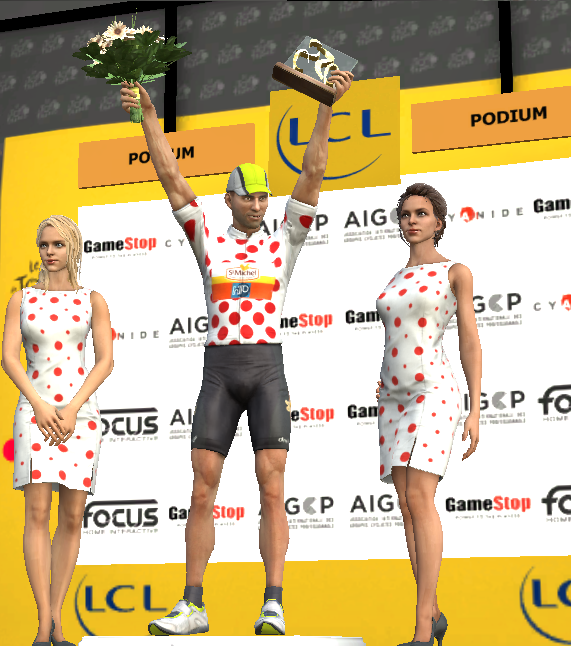 Should be a real challenge to achieve the KoM jersey in TdF, so looking forward to see how that goes. Congrats on winning two KoM jerseys already. Great debut season for Brochard so far! @ Tamijo & Yellow Jersey: Thank you! At this moment I am in april in my second season and just started training as a climber. I wanted to have a nice "fighter base" before developing as a climber too. @ Sykkel_Freak: Nice to see you are still around too, long time no "see". I just had to get back to PCM! Only one European race this period, the French individual time-trial championship. During this period, I will try hunt my first stage or classic victory. It seems like there is a time-trial in every stage race we compete in this season. I cannot do anything big here other than look forward. 2. Gustavo César Veloso +4"
Today’s plan is simple. Wait and see until the end what to do. There is a 2nd category climb at the end that I would like to win if there is no breakaway. I could also use my very good flat skill at the end and try a little "razzle-dazzle". With 8 kilometer left until the only climb of the stage, there was no breakaway anymore and I was in perfect position when the climb started. No other rider had a chance. I easily took the most possible KoM points at this stage. I decided to try taking part in the mass sprint today. I had a free role and had never done this before, my sprint is not that bad and with some cleverness, maybe I can get a top five placement. The sprint was very close and I was more than happy with a 7th place. 1. Gustavo César Veloso 3h09'53" 1. Gustavo César Veloso 3h17'53"
2. Andreas Stokbro st. 2. Sam Welsford +6"
3. Alois Kankovsky st. 3. Branislau Samoilau +13"
4. Filippo Fortin st. 4. Florian Kierner +14"
5. Rok Korosek st. 5. Emil Vinjebo +16"
7. J.C. Brochard st. 21. J.C. Brochard +27"
I waited in the pack during the whole race, let the breakaway fight for the first 2nd category climb, and spent no unnecessary energy at all. The breakaway managed to stay alive even after the second KoM sprint meaning I lost my provisional lead in the KoM classification. I tried my luck in the mass sprint this time too, finishing 13th. Jiri Polnicky won the stage. The pack did not allow any breakaway to break loose before some kilometer ahead of the first KoM sprint. The pace during the first climb was very high and when all breakaway riders was shut down 2,5 kilometer before the KoM sprint, I made my attack. I won the sprint and four riders followed me. One of them is Raileanu who is second overall in the KoM classification. Luckily, he finished fourth at the KoM sprint and I was back in the lead of the KoM classification. Our breakaway did not survive. Before the second climb, we were back with the pack. At the second climb I never managed to get in front, the pace was very high. 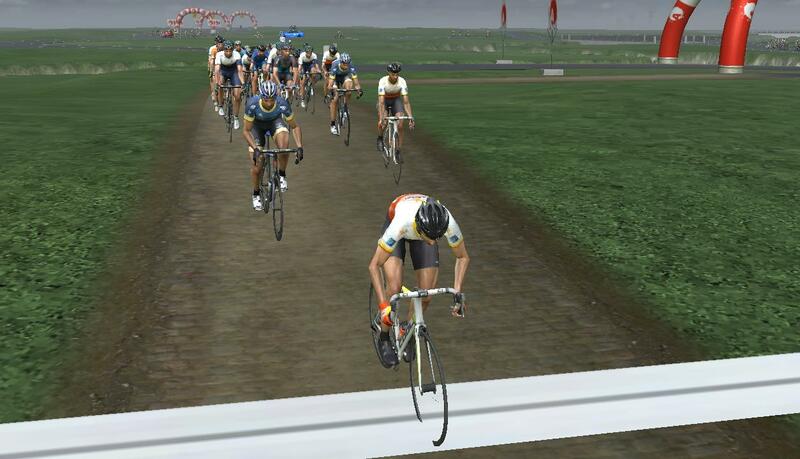 When the KoM sprint startet I was just way out of position and had almost nothing to give. Raileanu finished second, meaning I lost the KoM jersey. Alois Kankosky won this horrible stage and I flew home empty handed from this stage race. 1. Alois Kankosky 2h48'25" 1. Gustavo César Veloso 10h51'18"
2. Troels Vinter st. 2. Sam Welsford +6"
3. Tatsuki Amagoi st. 3. Branislau Samoilau +13"
4. Rok Korosek st. 4. Florian Kierner +14"
5. Michael Potter st. 5. Emil Vinjebo +16"
39. J.C. Brochard st. 21. J.C. Brochard +27"
Since this classic is the same day as most national championships, the start list is extremely weak. I also got a free role for the first time in a classic, so I will try and hang on to the end and make an attack at one of the last hills. 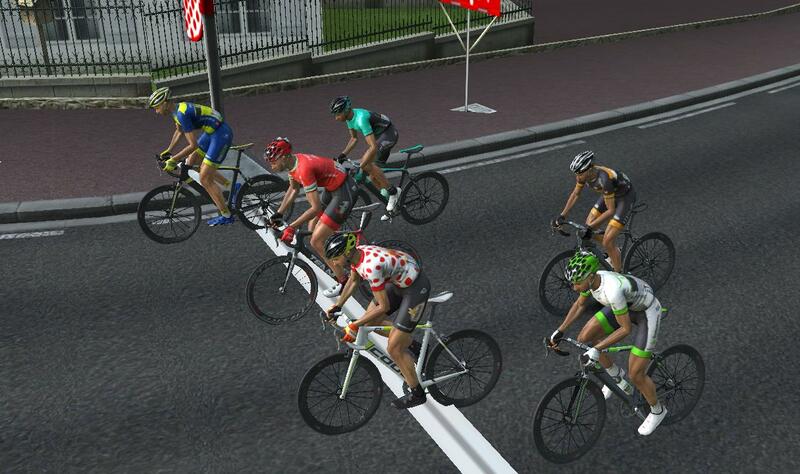 I made my attack with 10 kilometer left, and the breakaway still had a 1'03" gap. With my good flat stat, this could be possible but I do not see how I will manage to have fresh legs at the end if I catch the breakaway. The distance to the breakaway was too far and I gambled and tried to higher my own pace during the last hill. I did not get any closer to the breakaway and it made me so tired the pack caught me during the sprint. This period did not end up as I expected. 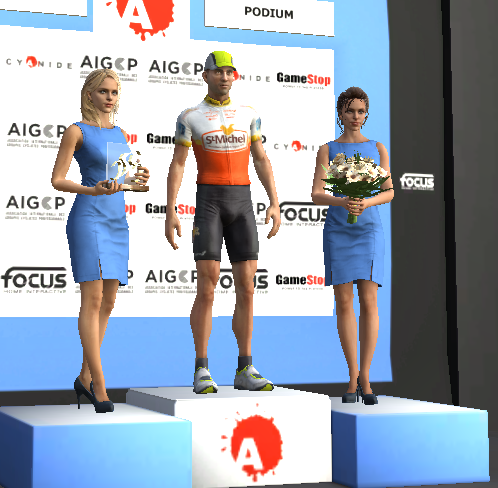 With that said, there was only one race with the stages I prefer, and there I finished 2nd in the KoM classification. If you look at it that way, the period was not that bad even though I came up with no results. Not really a highlight, but the best part of the month was carrying the KoM jersey in Tour of Mevlana. The first half of this period is very interesting. First there is a cobble classic in Sweeden followed by two .1 stage races in France where I hope to win at least one KoM jersey. Today’s plan was simple. Stay in the pack until the end. I am able to beat most of these riders at the end if there is a small group of riders, so as long as I am able to hang on during the cobble sections I will have a chance to fight for a top placement. After the last cobble section all riders was with the pack. Some riders had fallen behind but all favorites is left and there was no breakaway. With 13 kilometer left the pace was extremely high and I had to try find a perfect timing to when I can attack. The pace was so high I never even tried to attack and decided to wait until the mass sprint. The next happening is so absurd I have to warn you before you read it. I won the mass sprint. With a 66 sprint and a +2 today my sprint is not that bad, and when the whole pack just waited at each other with no lead-out trains at 2,8 PCM-kilometer left, I saw my chance and tried to start my sprint at that point. I even managed to get a 12" gap before the sprinters started to sprint. My first ever pro victory was a fact! 4. Oscar Van Wijk st.
Today’s breakaway was seven riders and me. 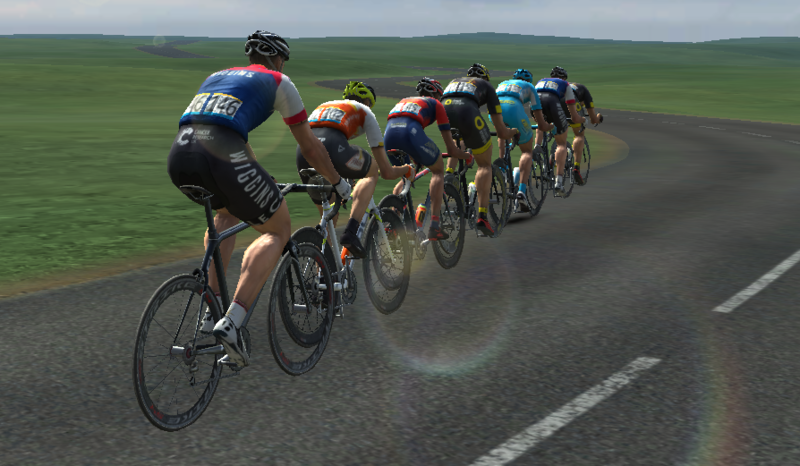 With 110 kilometer left there was 23 kilometer left to the first KoM climb and we had a 3'54" lead to the pack. During the climb, it showed early that there was only De Marchi and me fighting for the points. I have become really good with my timing of my attacks and know when to attack based on the slope of the hill. I surprisingly beat De Marchi easy at the first climb. At the next climb, not even De Marchi cared about the KoM points. A total of 12 points to me! There is also a KoM climb at the end but my energy is already running low and the favorites will probably have attacked by then. I fell behind on purpose and just waited for tomorrow. The breakaway actually made it alone to the finish line but I would have had no chance of following them. A tough stage with two 2nd category climbs at the second half of the race. I am not sure if I will be able to hang to the breakaway that long. I attacked from the very first meter and five other riders joined me. This time all riders fought for the KoM points. All six including me in today’s breakaway gave it all during the first KoM sprint. I finished second behind Warnier and gained four points. With 28 kilometer left to the second KoM climb, a 2nd category, we only had a 58" lead to the pack. I decided to try to set a higher tempo in the breakaway, without response. I ended up losing energy and the gap was now at 52". 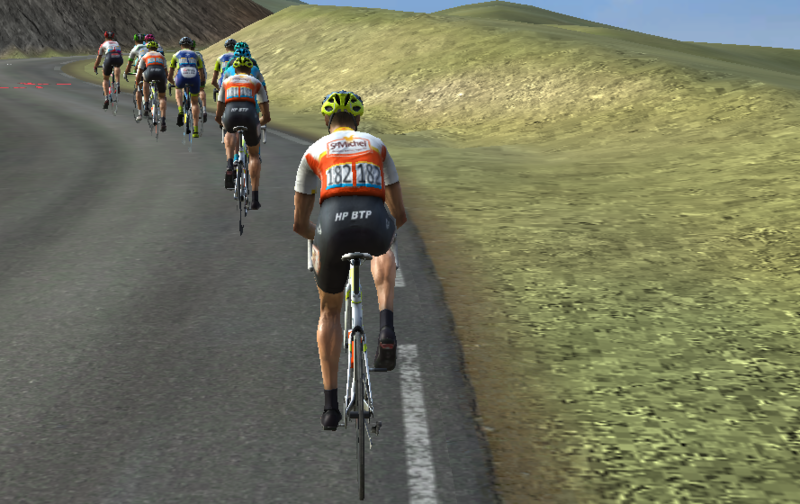 Now there was only Mullen, Hardy and I left in the breakaway with the pack chasing. I sprinted as the KoM sprint was the finish line, but the pack still caught me before the top and I finished third at the second climb. At the third climb, I was already was behind the pack. Jonathan Hivert won the stage. Same procedure as all stages. Go solo from the very first meter. 14 other riders including Paillot joined me. Warnier was also there with six points in the KoM classification. 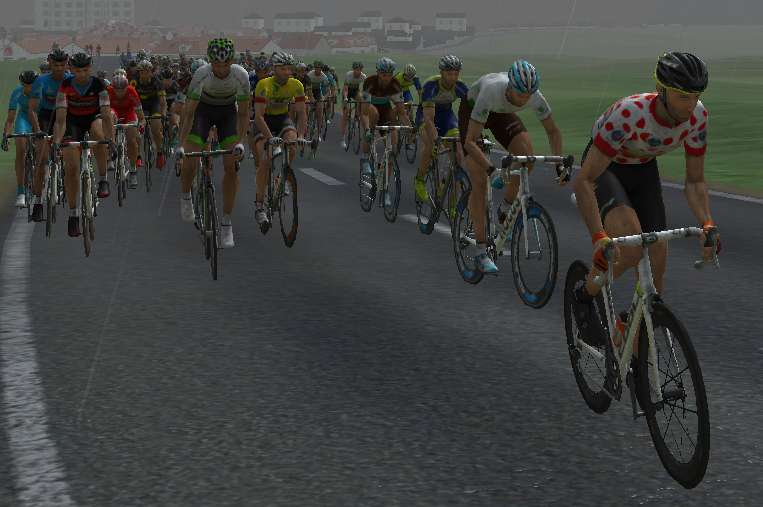 With so many riders, the first KoM sprint became a complete chaos and I did not manage to get a single point. Next up is a 2nd category climb, I have to come up with a much better plan then. 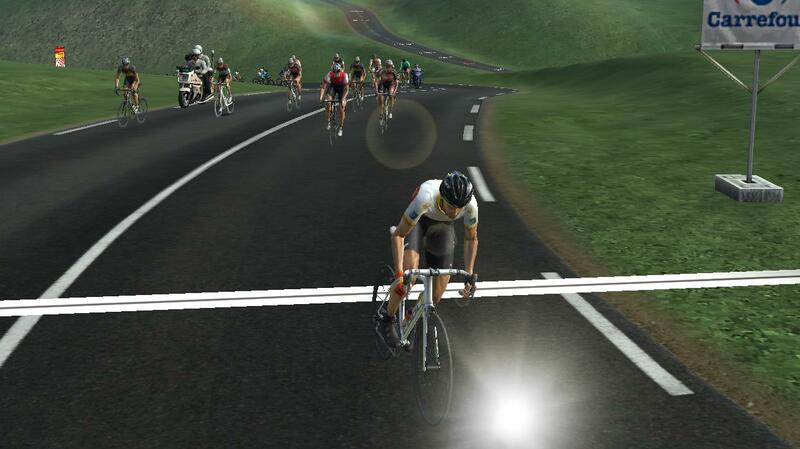 There was only six riders trying to win the next KoM sprint and I managed to finish at fourth place. Warnier won four points at the last climb but no points at this climb. In other words, my lead is still very safe. The rest of the breakaway riders and I surprisingly enough managed to stay in front a long time and with 8 kilometer left to the last climb, a 3rd category climb, we had a 2'04" lead. 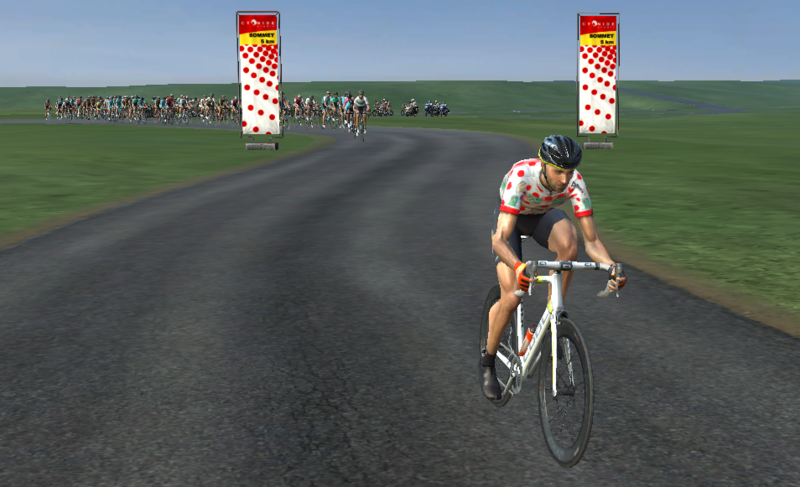 At the last climb, I finally managed to show them who the real king of the mountains is and won the KoM sprint. Was there a chance we could make it to the finish line before the favorites caught us? At least we went all in for it. I have secured my KoM jersey for this stage race and to try and maybe get a stage victory would be amazing. There was seven riders left in the breakaway and with 7 kilometers to go Schillinger made an attack. We now had more than three minutes down to the pack; it will be a rider from the breakaway winning this stage. With 4 kilometer left Schillinger was back with the rest of us and with 3,5 kilometer left the last and final climb started. Baugnies and I managed to get a small gap down to the rest of the breakaway and Baugnies had a couple of centimeters advantage with 200 meters left. Could I make it? Still angry about yesterday’s loss at the finish line I will try make an attack during the last kilometers during this stage. I have already won the KoM jersey, so I do not have to fight in a breakaway today. 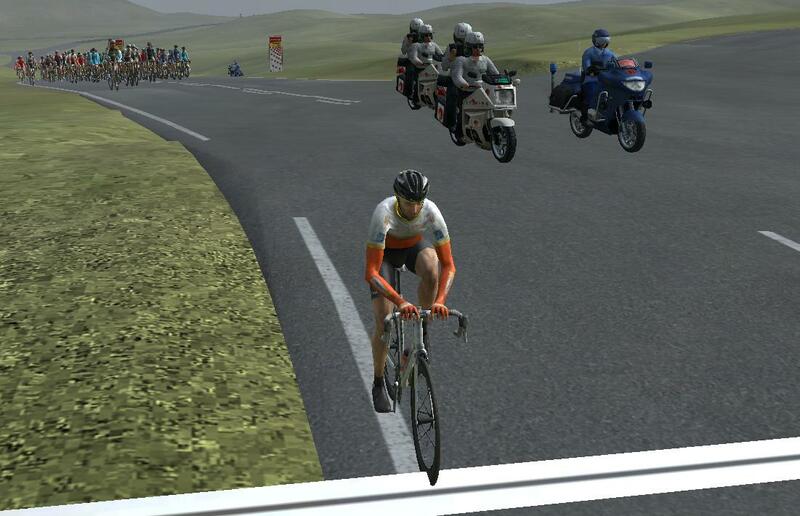 With 7,5 kilometer left, at the top of the small hill before the sprint, I decided to make my attack. I quickly got a 25" gap to the pack but it fell just as quick down to 15". Tired and irritated about yesterday I pushed myself to the limit and managed to keep the distance! My first ever stage victory was a fact! 1. J.C. Brochard 4h22'45" 1. Simon Geschke 18h01'55"
2. Thomas Boudat st. 2. Allesandro De Marchi +15"
3. J.P. Drucker st. 3. Jonathan Hivert +1'57"
4. Jérôme Cousin st. 4. Peter Kennaugh +2'22"
5. Jhonatan Narvarez st. 5. Stefan Küng +2'25"
There was seven riders in today’s breakaway including me. We had a steady pace towards todays' only KoM climb with a 1'15" gap to the pack. 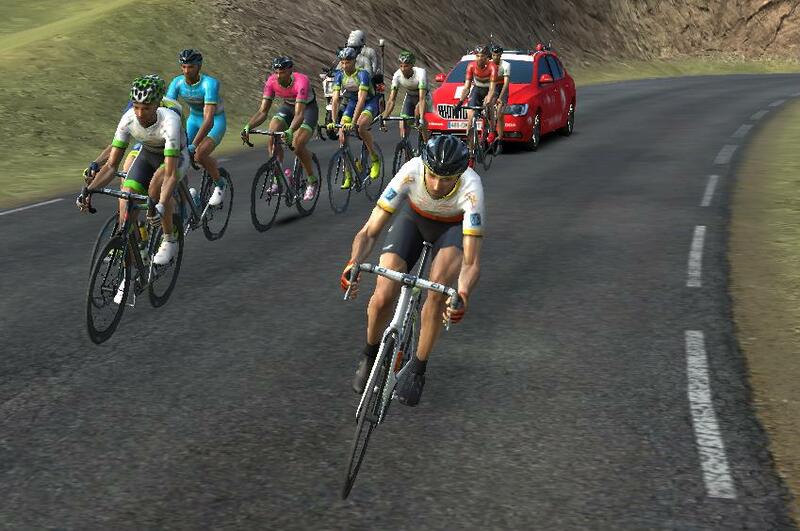 At the KoM climb, I thought I could start my sprint during the climb but had difficulties beating the two riders who attacked with 2 kilometer left at the flat. I barely managed to close their gap but I finished first and received five points. I fell behind on purpose to lose time and not use too much energy. 4. Tom Van Asbroeck st. / +10"
5. Hugo Hofstetter st. / st.
134. J.C. Brochard +19'23" / +19'33"
Since both KoM climbs at this stage is at the last half I will wait in the pack a long time before I make my move. I hope that today’s breakaway will be gone before the two KoM climb or at least be at close distance. With only a few kilometers left until the first climb the breakaway still had 1'20" so I had to try to attack at the flats so I maybe could catch the breakaway at the second KoM climb. I barely caught the breakaway between the climbs but when I was 20" behind I had no fuel left in the tank and the second climb had just started. I had to say good-bye to my KoM jsersey for at least one day. As usual, I spent the rest of the day taking it easy at the end of the pack. I desperately need the first place at this KoM sprint. I tried to escape from the pack at the very start. The breakaway was not big and we had only 28" down to the pack, but we could see the KoM sprint in the horizon. Only 15 kilometer. Gaudin was not in the breakaway. I pushed myself to the limit to keep the breakaway alive. With one kilometer left to the KoM sprint, we were a group of seven riders with a 39" gap to the pack. I had sacrificed everything to not be caught by the pack and Gaudin, now I had almost nothing left in the tank. Could I still make it first over the climb? I finished first over the climb! Five points to me and a tie game with Gaudin. Tomorrow is a time-trial so the last day of cycling will decide who wins the KoM jersey. As usual at time-trials, I have nothing to come up with against the other riders. Look forward to tomorrow. 1. Jonathan Castroviejo 26'33" / 12h03'35"
4. Vegard Stake Laengen st.
118. / 122. J.C. Brochard +3'13" / +38'23"
I felt great today! I started todays breakaway. Five other riders joined me. With 130 kilometer left we had a 4'01" gap to the pack and Gaudin was nowhere to be seen. With 90 kilometer left (and 10 kilometer left to the KoM climb) we had a lost a lot and only had a 2'52" gap to the pack. After this KoM sprint I had nothing to lose and will go for the stage victory. 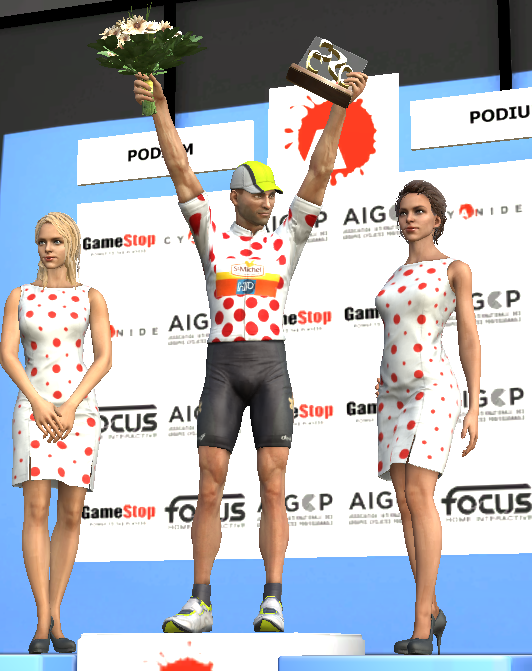 First - win the KoM jersey. It was easy to win this sprint. 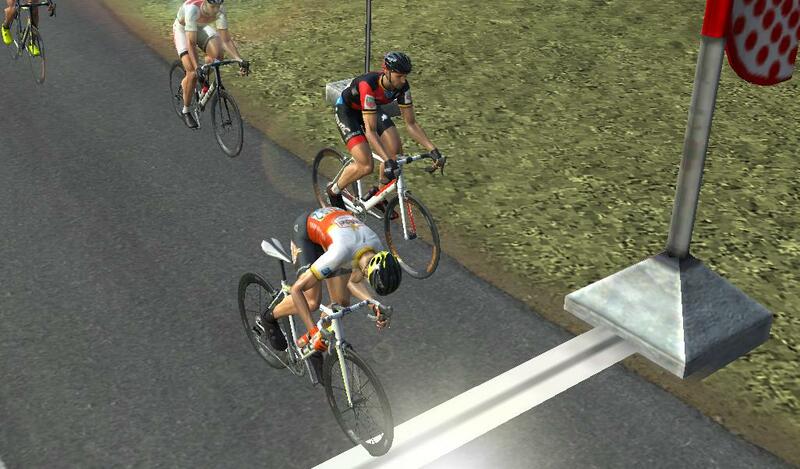 I just put myself in front of the breakaway and when we hit the climb, I attacked. Two riders followed but did not even manage to come close. Easy victory! We tried to push for the victory in the breakaway, but had a tough time keeping the pack at a distance. I soon have to decide if I think the breakaway can make it to the finish line together or if I should go solo. With 12 kilometer left we had a 1'16" gap but my energy was running low. I do not know if I can perform a good sprint if we are not caught by the pack. With 4 kilometer left we had a 16" gap and I had to leave the breakaway and go solo. I was the first person to go under the flame rouge and thought I had the victory in my pocket. That was when two riders came up fast as a lightning on my right side and I realized my victory was gone. 2. Rudy Barbier st. 2. Jasha Sütterlind +2"
3. Damien Touze st. 3. Ben Hermans +5"
4. Tom Van Asbroeck st. 4. Vegard Stake Laengen st.
5. Sasha Weemaes st. 5. Thomas Scully +13"
14. J.C. Brochard st. 119. J.C. Brochard +38'21"
It was time to decide my future. I could see myself going to Vital Concept Cycling Club, but I think it will be a too big step for me fighting for a possible Tour de France spot. I decided to stay at St. Michel - Auber 93 to win more classics and KoM jerseys. When I can make a top five placement in the general classification in hilly stage races at a consistent basis, hopefully in 2019, I will make the next step to a higher division. The last hilly stage of this season. Only 115 kilometers long. This is my last chance to get a victory, three victories this season would be amazing, but my goal is top five. I would not complain about a fifth place today. I waited in the pack during the whole race. With 20 kilometer left I had lost a lot of power in my legs but I was still somehow still here. There is a hilltop right before the sprint, I wonder if I should attack there or wait until the mass sprint, my sprint abilities is not that bad. I had planned to attack at the last hill but did not even manage to hang on to the favorites. I finished third at the mass sprint with the pack, which is not bad at all. A descent finish in the end! 4. Robigzon Leandro Oyola st.
5. Luis Miguel Martinez st.
Another amazing month! This one to cap off-season. This season I finished two times at the podium at a stage or classic, all in this period. I also added two KoM jerseys in the mix. Amazing finish to a very nice rookie season! Winning my first classic and first stage ever! I am very happy with my rookie season as a pro cyclist. I feel I got almost the maximum result I could have with my skill set. I still love fighting for KoM jerseys but if I want to get attention from the Pro Tour teams, I also need some good classic and general classification results. That will be the focus in 2019 together with the KoM jerseys.